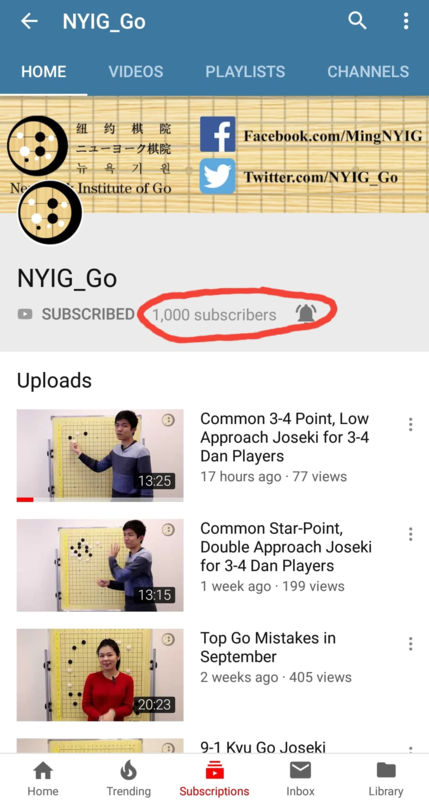 The New York Institute of Go’s (NYIG) official YouTube channel (NYIG_Go) recently achieved a significant milestone, reaching the 1,000 subscribers mark. “I was surprised by how quickly the numbers are climbing, since our videos are so short and simple,” says Stephanie Yin 1p, NYIG president. “Our goal is to present the English-speaking go community with kick-start knowledge on all aspects of the game,” added Ryan Li 1p. Current active series on the channel include “Mistakes of the Month” and “Joseki Lessons.” “Stay tuned for the weekly uploads!” Yin said.